I have written a true story about my four stepdaughters from a previous marriage. They have each been dealt a very difficult hand and I wanted everyone to understand what they have been through. Their story needed to be told because they represent so many women. 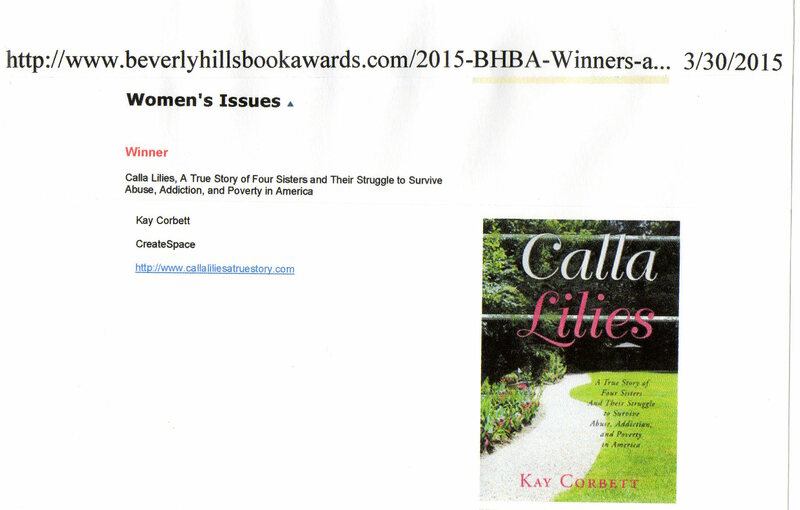 Calla Lilies: A True Story of Four Sisters and Their Struggle to Survive Abuse, Addiction, and Poverty in America. This very serious book reads like a novel with their conversations reflecting the events in real-time. The narrative definitely is NOT boring! These are gutsy women. I am involved in several organizations working to improve people's lives. I continue to sing as a hobby and still enjoy very much singing in choirs. My husband and I have traveled much of the world and continue to travel quite a bit. We used to do adventure travel but now mainly do cruises. I also love to garden and the cover of the book is part of my backyard. I worked about six years on my backyard to have the garden that I wanted. Spring, summer, and fall are delightful here in Virginia and I enjoy relaxing on the deck taking in the beautiful flowers and trees.